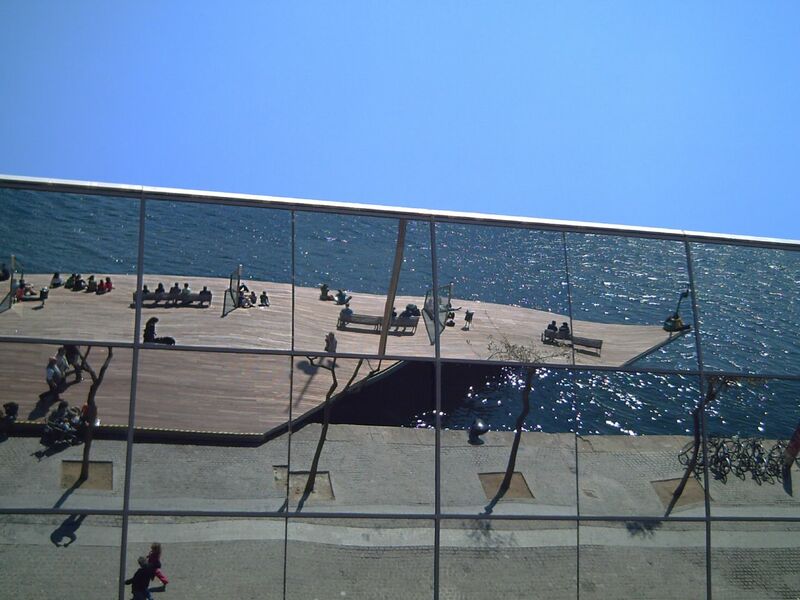 If you ever come to Barcelona, it is mandatory to go to Port Vell, specifically the Maremagnum area and walk along the planks of the stylish wharves where you can admire the reflections of the Mediterranean Sea, the Mare Nostrum, on the mirrors of the nearby shopping center (buying is optional). Satellite Image of Maremagnum, Barcelona on Google Maps. Looks like a wonderful place. I bet the shop owners don't think that buying is optional! Great shot Carlos. Very interesting to view. Strange and disorienting shot - I can't tell which way is up! Saludos, acabo de descubrir tu blog y me p[arece magnífico. Tienes unas fotos excelentes. Ya volveré por aquí. stunning carlos! for a moment I thought the sea was perfectly cropped until I realised it's the reflection of the mall. window shopping anyone? Thanks Rock, John, Jenny and Edwin. Thanks Goncolo, welcome to my blog. and yesterday's photo is lovely! Muy buenas las fotos que aquí aparecen, enhorabuena. Blue skies must be the theme today! I see lots of beautiful sky shots today as I go around the photoblogs! And I love it! Ooooooh yes, Carlos, this is one of my kind of shots! Always on the look out for original reflections, mod. buildngs, ancient, water. this is one I truly admire, it's clever, humorous, even disturbing, depending on how you look. Great! Hahaha Alice, I am sorry you get misled by so many mirrors and frames. The sea is there somewhere over the rainbow. Gracias Manuel, tengo que ver pronto tus magníficas fotos. Thanks Kris for your always praising my work. Your a true friend. Hola Dammy muy ocurrentes tus dos blogs. La verdad es que visito mucho Murcia cuando voy de vacaciones, bueno realmente paso por Cehegin, cerca de Caravaca (o viceversa, hehehe). En Cartagena y en Lorca he estado, en Aguilas también. Gracias por tu visita, un saludo. Hi Anne, I am glad you too like blue skies. I have to see the rest of pictures. Thanks. Super shot. Reflections always make for an interesting perspective. No, you are wrong. You MUST buy there! I got my shoes there. The most comfortable ones I ever had. Great shot! i love this shot & it looks amazing when caught as a reflection. kudos to you! Wow! thats great shot, Carlos!